For thirteen years after the towns founding the Townsville Magistrates Court and the visiting Circuit Court sat in uncomfortable rooms in the Court and Customs House on Melton Hill overlooking Wickham street. in 1875 the Queensland Government decided that a new Magistrates Court House should be built at the corner of Sturt Street and Stokes Street. That region was then mainly virgin scrub with a few houses dotted through the bushland and one or two tin shanties occupying the proposed site for the Court House. In July 1875 the enterprising Edward Head returned to Townsville from Sydney. Considering the regular visits of judges and legal personnel of the District Court and of out-of-town litigants Head reasoned that a hotel close to the Court House could supply both food and accommodation besides attracting a substantial bar trade. He erected the first Court House in August 1875. Apart from the usual bars dining rooms etc. it contained six bedrooms and two sitting rooms. The local newspaper thought it would be no discredit to any street in Brisbane a very creditable structure and a boon to dust-troubled citizens. For once Heads golden touch failed. Several other hotel proprietors built hotels at this time resulting in an over supply of hotel accommodation. Although some licensees went bankrupt Head weathered the storm. Following his election as Mayor of Townsville he transferred the licence to Arthur Silvester in 1878. It was during Heads term as Mayor that the Town Clerk was arrested for embezzlement. In attempting to cover his tracks he burned down the Municipal Council offices then housed in a building rented from C.O. Price in Denham Street. Head was suspected of being implicated and resigned in 1879 after which he left for Sydney. The next Municipal Council offices were in Stokes Street in a building owned by Head opposite the Court House. He retained his interests in Townsville becoming increasingly wealthy and eventually acquiring the Sydney mansion Como. In the 1890s Head and his son George were the major developers of the Keelbottom copper mines. The Court House was sold in 1879 to William Landers who in 1880 when the Northern Railway was being built established a mail coach run from his hotel to the railway camps ensuring its popularity with workers on the railway. Landers acquired considerable property as the railway opened. Mount Landers in that locality was named after him. In 1883 he transferred the licence to his nephew-in-law Edward Downs in order to build a new hotel the Tower close to the new railway station in Flinders Street. After Downs left in 1884 the licence passed through several hands. By 1885 some of the towns more flagrantly obvious brothels were behind the Court House Hotel. Visits by Maggie the Stag or the Woman in Red considerably enlivened life in the area. The proximity of such an establishment to the Court House was a source of annoyance to some amusement to others. In 1887 Charles Wyatt took over the hotel; by then it seems that the brothels had been removed to make way for the Oddfellows Hall. He first became well known in the town as a mail contractor running mails to the Ravenswood goldfield in the late 1860s. From 1870 he lived in Townsville first as a carrier to Georgetown then as a storeman for Aplin Brown & Co. where he was renowned as a strong man; few could equal his strength in lifting heavy weights. He was a member of the Masonic Lodge of the Turf Club and of the Show Society where he was a respected judge of livestock. 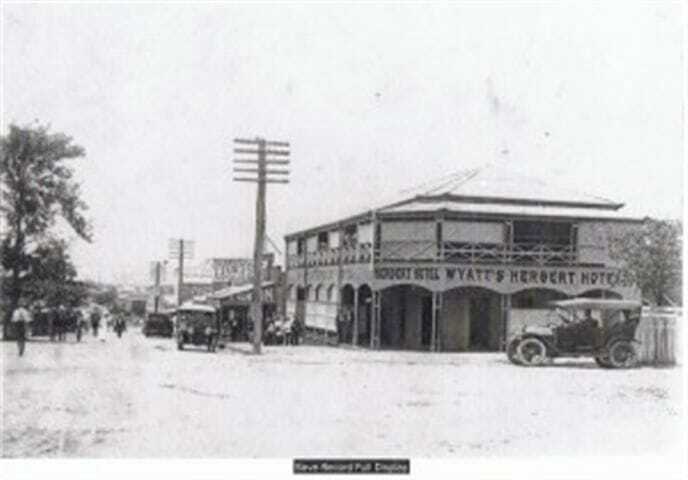 Wyatt was licensee at the hotel for seventeen years until his death in 1904 one of the longest-serving publicans remaining at one hotel in Townsville history. His genial character greatly enhanced the hotels reputation; for the last four years of his life he was an invalid suffering from chronic rheumatism leaving his wife to run the hotel. After his death it passed first to his widow then to his son-in-law John Fitzpatrick who changed the name to Herbert in June 1910. The original hotel was replaced by the present brick building in the 1920's.